Because traditional eLearning has mostly been about presentations and activities designed by expert instructors, distributed to learners via desktop and laptop screens, we tend to forget the power of the multidirectional capabilities of mobile devices. Mobile phones are not just for phone calls, and tablets are not just for viewing materials; both can also be used to collect data in several different formats and send them to a central server or other people. With a server and appropriate software the data can be aggregated and analyzed, with tables and visualizations automatically generated, creating new knowledge that can be distributed to many others via electronic networks. Gathering research using mobile devices is an active and valid learning activity because learners must engage in the real world in which they are immersed, using their mobile phones or tablets to record and send back interesting information about the context in which they are located. The use of mobile devices dramatically increases the sheer number of observation points that are potentially available to researchers, as well as opening up the possibilities of automatic data collection through programs that track user location and activities. With more than 6 billion mobile phones in use worldwide, a number that is expected to rise to 1 billion smartphones by 2013, the mobile phone network is emerging as part of a “global brain” with sensors everywhere. Companies such as Fourier Systems provide inexpensive purpose-built mobile devices that are specifically designed for data logging for both school science projects and industrial settings. We are only now starting to grasp the immense potential of mobile devices for research. Let’s look at some examples of how mobile devices are being used as research tools. One obvious area of developing research is on the use of mobile phones themselves. For example, Nokia hired U.K. company GfK to monitor their whole portfolio of digital channels, including both standard and mobile websites or online shopping. This posed a number of challenges in developing an online survey that would work on both the mobile phone as well as the PC, across all possible brands and models of mobile phone, on the various different mobile operating systems, as well as in all the languages for the countries in which Nokia operates. Nevertheless, GfK achieved over 100,000 completed interviews in less than a year. Because they are data collection devices, mobile phones can be used to track users’ behaviors while they are using their phones to see who, how and why they use specific apps or websites. UserZoom has developed a user experience (UX) research tool that collects this data for iOS and Android devices. Researchers are able to conduct studies on persona definition, satisfaction surveys, usability testing, exit opinions, and more. Actual behavioral data is collected as well as the results of surveys. With the proliferation of channels communicating brand messages to consumers in today’s world, there is a growing need to help businesses understand which messages are the most effective and how they resonate with consumers. “Mobile Moments of Truth” is a research tool being developed by GfK that uses the mobile phone to capture and collect the full range of brand experiences. Rather than waiting to ask consumers to recall all brand exposures during a given time frame, selected consumers are able to take an image using their mobile phone every time they see or experience a brand and give a short report on where, why and how they felt. This is all achieved through a simple online survey tool which not only gives time sensitive, granular feedback, but also consumer-created images that give a real-life context for each experience. In another example, Qustodian, a Spanish start-up, connects people with brands they like via their mobile phones. Members choose the companies they’d like to hear from, then earn cash by downloading apps or checking for the latest news and offers from their favorite companies, and answering surveys. Qustodian already has more than 50,000 members and has worked with brands including Pepsi, Adidas, and Ford. Hewlett-Packard conducted a qualitative research project that followed the purchasing paths of incoming college students by allowing them to use their mobile phones to document their behaviors. The methodology included the use of mobile cameras and screen tracking to follow the students’ movements and experiences throughout the day. This kind of data is invaluable to market researchers. Because they are carried around by most people, mobile phones seem particularly useful for research in the human sciences. Surveys, questionnaires, videos, audio recordings and polls can be produced using mobile phones, tablets and notebook computers. But what if you want to go beyond surveys and questionnaires and get more in-depth descriptive information from people via their mobile phones? There’s an app for that, as well. In a different approach to mobile research, a team at the London School of Economics has launched an iPhone app to discover how people’s feelings are affected by their surroundings. The Mappiness app asks people a few times a day to say how they are feeling, what they are doing and where they are. It can also use GPS to pinpoint the user’s location. More than 45,000 participants have already signed up, generating more than 3 million geo-located responses. It is not just the behavior of individuals that is being researched using mobile devices. They are also being used to make sense of social networks, and the connections among large groups of people. Harris Interactive is using GPS data from mobile phones to track respondents’ locations as they combine the use of social media and other data with survey results. GPS can be used to observe behavior patterns, look at how people use the mobile Web when they’re out and about, and send relevant surveys to participants based on their location. Their Research Lifestreaming service has already tracked more than 20 million Facebook posts from 20,000 participants in the U.S. Monitoring subtle social signals is now possible thanks to mobile devices. Professor Alex (Sandy) Pentland and his colleagues at MIT have invented a “sociometer,” a specially designed digital sensor worn like an ID badge that monitors and analyzes social interactions among groups of people. In his book, Honest Signals, Pentland suggests that by “reading” our social networks with these devices, “we can become more successful at pitching an idea, getting a job, or closing a deal.” They are also devices being used to research how people interact with one another. [A]n agricultural researcher might look at a field and try to glean clues about erosion and rainfall to better map conservation directions. With the help of a mobile phone’s GPS the coordinates of the researcher’s location are sent to a modeling service hosted in the cloud to calculate soil erosion and other agricultural elements based on any number of given conditions. Within that remote resource, the coordinates will be matched to stored information about the nature of the area in question. Furthermore, as more is known about particular areas on the map, more information will be added to the cloud service’s well of geological, agricultural, hydrological and other data. As more and more farmers use mobile devices to document and manage their farms, or the food distribution chain tracks the location and condition of food from field to table, the mass of data collected will be mined by agricultural researchers in the near future. Whether we like it or not, we are all crowdsourcing for someone’s research as our movements and actions are tracked and documented. The potential of using mobile devices and networks to track diseases and therefore do research on how and where they spread is now well recognized. The SARS outbreak of 2003 resulted in hundreds of deaths and billions of dollars in economic losses. There was evidence of this disease on the Internet as early as November 2002. Since that time, the tracking of diseases and disasters through mobile technologies has improved greatly. A mobile phone-based health program called Alerta DISAMAR allows Peruvian military doctors to report disease outbreaks and ask for help with treatment. Laboratories that test for diseases, traditionally isolated from each other, are now being connected by computer networks in order to share results and to integrate the inflow of data about diseases. This ability is invaluable to epidemiologists. There are many other examples of mobile research in healthcare. Health information is changing the ways drug makers develop medicines and communicate with doctors, insurers and patients, the report said. Information from patient records is helping companies design more cost-effective clinical trials and tailor marketing materials to the people who most need them. For example, mobile phone software can help patients find clinical trials for cancer or track blood-sugar levels. A 2006 project with school students in the U.K. called Mudlarking in Deptford showed how mobile devices can involve anyone in the collection and transmission of data as part of personal research or crowdsourcing. Mobile computing is one of the technologies that have fueled the rise of “citizen science” in which anyone with an interest can become a dedicated researcher. “Citizen science” is already happening in a big way, aided by the widespread distribution of smartphones, and more recently, the explosive growth of adoption of tablet computers. For example, the What’s Invasive? project uses community data collection with mobile phones to locate and track invasive weeds that are threatening native plants and animals in several different locations in the world. Other citizens are gathering information on pollution sources, identifying birds, or plotting bicycle use, and feeding their data into applications that analyze patterns from this information. Researchers in the SixthSense project at MIT are building prototypes for wearable devices that will automatically collect data as the wearers move around their environment. We are just beginning to scratch the surface for the use of mobile computing in research. If you have a research project where mobile data collection may be appropriate, give us a call at Float Mobile Learning to discuss how we can help you set it up. Gary Woodill is a senior analyst with Float, as well as CEO of i5 Research. Gary conducts research and market analyses, as well as assessments and forecasting for emerging technologies. 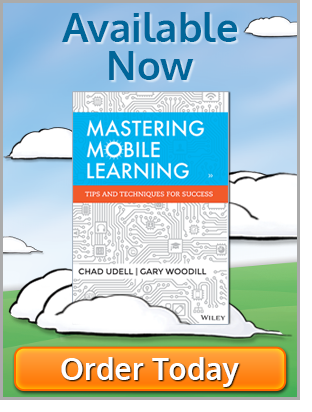 Gary is the co-editor of "Mastering Mobile Learning," author of “The Mobile Learning Edge,” and the co-author of “Training and Collaboration with Virtual Worlds.” He also presents at conferences and is the author of numerous articles and research reports on emerging learning technologies. Gary holds a doctor of education degree from the University of Toronto. Which Cross-Platform Framework is Right For Me? Is Social Learning Dead? Not At All!